A horde of people filed onto the 14-Limited bus at Mission and 24th Street on Day 1 of October’s BART strike. Photo by Courtney Quirin. It was not the best of days to try Muni for the first time. Nevertheless, Italian tourist Eleona Brianzoli decided to test her luck. “I thought it would be busy because of the strike,” said Brianzoli. And it was. 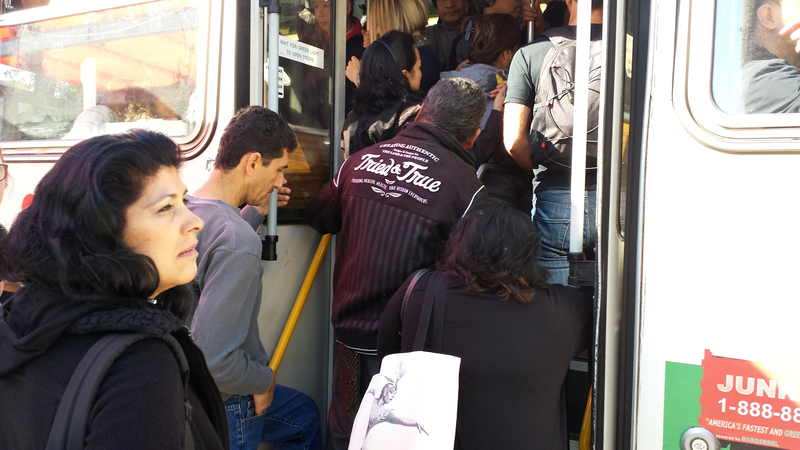 Even with Muni adding 16 more buses to the 14 Mission, 14-Limited and 14X lines today the buses were packed. 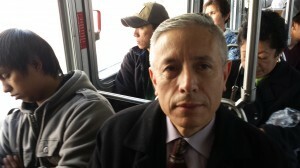 As of 11 a.m., 6,000 more riders boarded buses along the 14 Mission route. Both the J-Church and N-Judah also saw an increase of 1,900 trips each. The new riders meant that everyone experienced Muni at its worst. Passengers jammed in and rides took longer as more commuters got on and off at each stop. “Normally, it’s not this packed,” confirmed a 14L driver this morning during the height of rush hour. The 14 bus lines follow a similar path to BART’s – starting at the Daly City BART station and headed to Mission and Main – so that all offer commuters a viable alternative. “At least I can take the bus,” said Jorge Duarte, a 55-year-old banker headed from the Mission to Daly City. “People in the East Bay don’t have that choice.” Still he said, on BART his commute takes 15 minutes and today’s trip took him more than an hour. Others accustomed to the relative swiftness of BART, found Muni slow. Justin Lord hopped on the 14L at the Daly City BART station and his normal 15-minute commute transformed into a 45-minute ride, making him “way late” for work. Mano Viray was in the same boat. His commute downtown via the 14L to downtown added 45 minutes onto his trip. “There are too many stops, that’s why I take BART,” he said. In fact, Muni is one of the slowest major transit systems and among the least reliable and most overcrowded, according to SPUR, a San Francisco Planning and Urban Research non-profit. Add into the mix a jump in riders getting on and off at stops, delays were inevitable. The crush of riders affected everyone. Lynn Sanchez, a 33-year old single mother, uses the 14L to pick up medicine at the San Francisco General Hospital. She travels with her six-month old child Joaquin. “With more people on the bus, it’s difficult – I can’t squeeze in, I can’t get a seat,” she said adding that the crowds also made her son cry. If the strike persists, some on Muni said they will lose work. Diana Hernandez, who was on the 14L today, also travels to Concord once a week to clean houses. If there’s a BART strike she will have to cancel her gig. “It’s one day’s worth of work,” she said. Others said they felt like their money was being stolen. “It’s not fair. I have a monthly pass and my money is being wasted!” said Yuki Lee, a 24-year old student at City College of San Francisco. Lee’s Muni-BART pass costs $76 whereas a sole Muni pass is $66. All of this failed to endear some riders to BART strikers. “The union is being unreasonably selfish. They’re not listening to us at all,” said Samantha Keat, a 29-year old veterinarian who had two hours added onto her day as she had to resort to a combination of Caltrain and three buses just to get to work. Others thought both sides were to blame.